However you feel about Christmas, even if you loathe the holiday or are ambivalent to it, there's probably a Christmas song for you. For Vancouver based JINGLE BELL ROCKS! director Mitchell Kezin, that song was Nat King Cole's “The Little Boy that Santa Claus Forgot”. It's a song about a kid with an absentee dad who, despite being good and having a perfectly reasonable Christmas list, winds up being passed over by Old Saint Nick. “The Christmas Song” it ain't, but nonetheless it struck a chord with Mitch, whose own father was frequently absent (or might as well have been) around the holidays. As strange as it might seem, that one dreary carol started Mitch down what he thought was a lonely road collecting Christmas music, and despite the film's title, not just of the rock and roll variety. As it turns out, though, there's actually a sizable underground of Christmas music collectors, many of whom put great time and effort into searching for rare records and then making mix CDs of their finds for friends and family each year. Once Mitch realized how widespread his hobby was, he decided to make a movie about it. 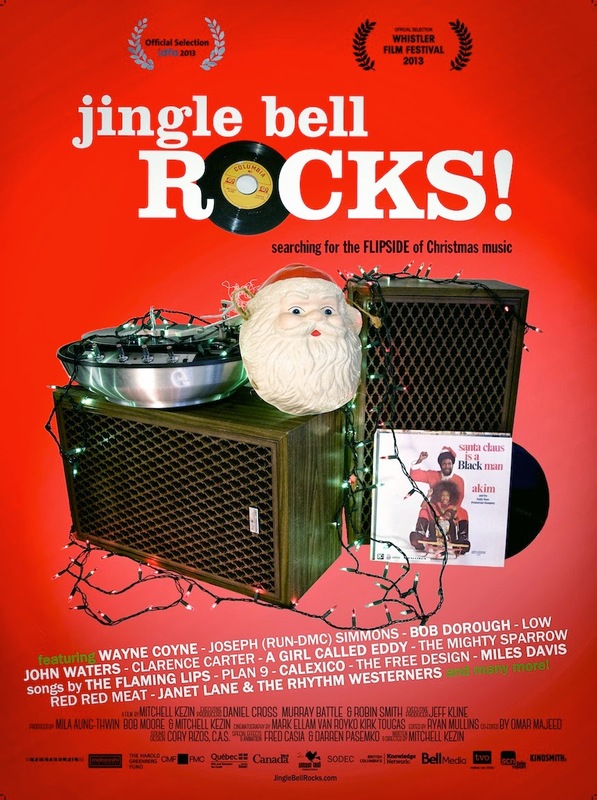 In JINGLE BELL ROCKS!, Mitch introduces us to fellow collectors like former Def Jam Records producer Bill Adler and filmmaker John Waters, and also tracks down some of his favorite Christmas music performers ranging from the known, like bebop pioneer Bob Dorough and rappers Run DMC, to more cult performers like soul singer Clarence Carter (“Back Door Santa”), jazzy folkies The Free Design (“(Close Your Mouth) It's Christmas”), and indie rockers The Flaming Lips, who made the film CHRISTMAS ON MARS. It all leads to a surprisingly emotional conclusion in which Mitch gets to make his own contribution to Christmas music history. Although Mitch does appear on camera and the film is upfront about being from his point of view, it never feels self aggrandizing the way the films of Michael Moore, Morgan Spurlock, and Nick Broomfield sometimes can. Once he gets his personal story out of the way, Mitch puts the focus of his film where it belongs: on the musicians who made these often quirky songs, and the other obsessives who share his passion. Sure, on one level this is just a movie about some weird guys and their weird hobby, but it also manages to find something to say about the human condition that just about anyone can relate to. And it's a lot more fun than yet another documentary trying to change your politics or make you eat better. 3 out of 4 stars.